The Army said that the top leadership of the Pakistan-backed Lashkar-e-Taiba in the Kashmir Valley has been wiped out with the killing of six militants in Jammu and Kashmir's Bandipora district. 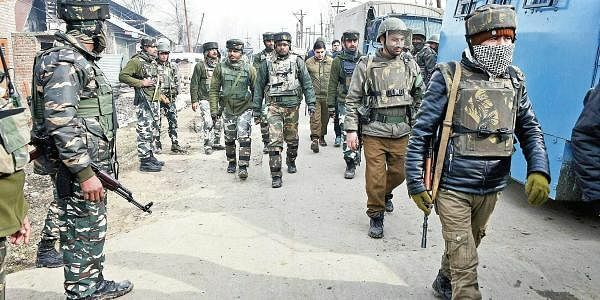 SRINAGAR: The Army said on Sunday that the top leadership of the Pakistan-backed Lashkar-e-Taiba (LeT) in the Kashmir Valley has been wiped out with the killing of six militants in Jammu and Kashmir's Bandipora district. Lt General JS Sandhu, who heads the Srinagar-headquartered 15 Corps, told reporters: "With the elimination of six of its terrorist commanders yesterday (Saturday), the top leadership of LeT in the Valley has been wiped out." Giving details about Saturday's operation, he said: "Hajin was an area of concern for us. Terrorists had killed some people in the area. We inducted Special Forces into the area. Good information started pouring in. We were keeping Chandegeer village on our radar. These terrorists had been staying there in a house for two to three days." The General identified one of the terrorists killed as Osama Jungvi or Owaid, a nephew of Zaki-ur-Rehman Lakhvi and probably the son of Zakiur Rehman Makki. Six Pakistani militants including Owaid and two other top commanders of LeT, Zargar and Mehmood, were killed on Saturday. An IAF commando was also killed in the gunfight. "We look forward to continue the operations and restore peace in the Valley very soon," the General added. "We are working on two lines," he added. "One is counter terrorism and the second is that we want the local terrorists to return. "We pulled out and saved an injured militant in Kulgam and saved his life. The local terrorists must realize whether they are 'Mujahids' (Islamic fighters) or proxies of Pakistan." Jammu and Kashmir Director General of Police S.P. Vaid refuted the claims of the Islamic State that claimed that the Zakura, Srinagar, attack on Friday in which a police officer and a militant were killed was the first IS attack in Kashmir. Asked to comment, he said: "No, it is yet to be verified. I don't think ISIS has any presence here." Vaid complimented the Army, the Central Reserve Police Force (CRPF), Police and intelligence agencies for Saturday's killings of militants. "Hajin was witness to terror for the last year or so. Fortunately yesterday's operation has cleaned up the area and people will live free of terror." A senior CRPF officer added: "The synergy among the security forces has been excellent and this is significantly responsible for the successes we have been getting." "A large number of boys about to join militancy have been weaned away. With the surrender of footballer Majid Khan, we are entering a field where lot of local boys are willing to come back. Many boys willing to come back do not know the ways and means. We have opened helpline numbers so that contact can be established with us by those who want to come back."